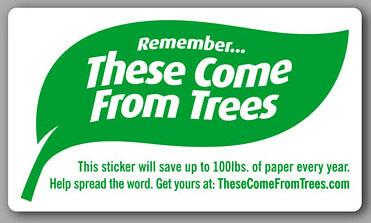 Last week, after replying to an unsolicited mailing from an investment firm, I thought that it would be useful to have a series of stickers and Post-Its to make people aware about consumption. I learned about your sticker this morning from Daisy of the Alliance for Climate Education. Are you interested in having a line of stickers and Post-Its which would address the consumption of energy, paper, plastics, etc.? I think what you guys are doing with this sticker project is amazing, keep up the good work! I LOVE THIS IDEA! I HAVE SEEN SOOO MANY PEOPLE WASTE LIKE 5 PAPER TOWELS TO DRY THEIR HANDS! ITS SUCH A WAIST, ONE IS ENOUGH! Looking for the thriller and adventure.Visit the olive sillari villas. Book tickets in advance and enjoy the trip. You are doing a great job, by giving the message of saving trees because they are very useful for us. They give us many useful things especially oxygen without we can't even think of living.